Supply ventilation units. Maximum air flow up to 3500 m³/h. Ventilation units for efficient supply ventilation in various premises.Controllable air supply, heating and filtration.Compatible with 400x200 up to 600x350 mm rectangular air ducts. The casing is made of double-skinned aluzinc panels, internally filled with mineral wool layer of 25 mm for heat- and sound-insulation.The mounting brackets with anti-vibration rubber mounts on the casing bottom ensure easy installation.The hinged panel of the casing ensures easy access to the internals for cleaning, filter replacement and other maintenance operations. Asynchronous external rotor motor and centrifugal double-inlet impeller with forward curved blades is used for air supply.Single- or three-phase motor modification depending on the fan model type.Integrated motor overheating protection with automatic restart.Dynamically balanced impeller.Equipped with ball bearings for longer service life.Reliable and quiet operation. Setting low, medium and high speeds for the supply fan as well as air flow control. Setting and maintaining supply air temperature. Setting or week-scheduled operation of the unit. Filter clogging control with a differential pressure switch. 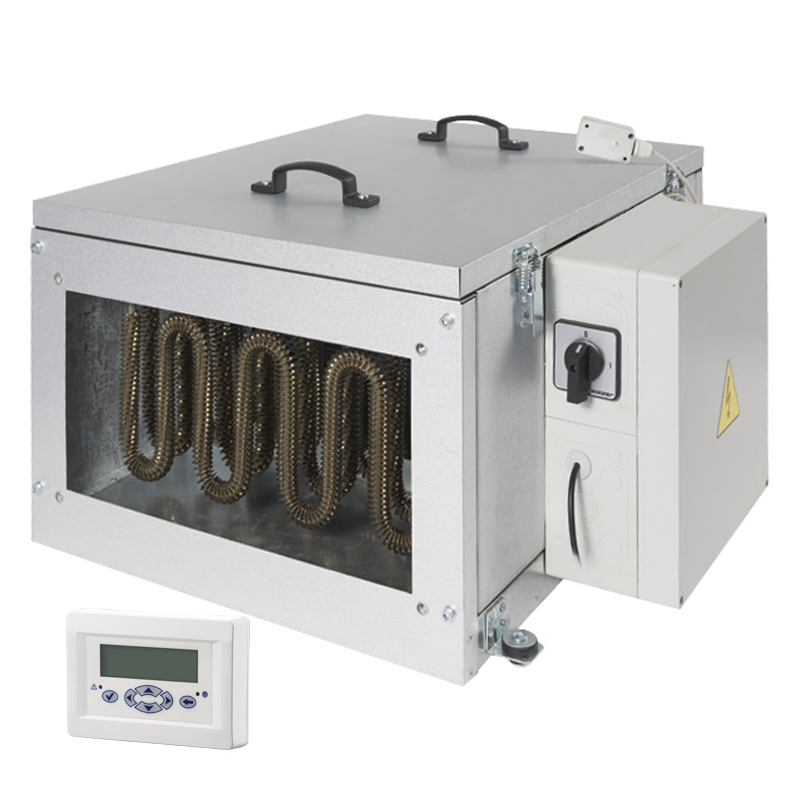 Overheating protection of the electric heating elements. Disabling heater activation during the fan shutoff.